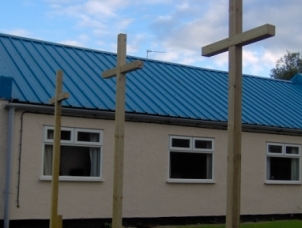 Why does Whybridge Church have Three Crosses? In the Bible we read Jesus died on a cross to pay the penalty for the sins of sinners. If they accept His invitation to believe in Him (trust Him as Lord and Saviour) and receive eternal life. Sinners = anyone who has ever broken Gods standards even once. Non Sinners = anyone who has a 100% record of perfect living. The centre cross reminds us of Jesus death burial and resurrection to pay for our sins. John 3:16-18 For God so loved the world that he gave his one and only Son, that whoever believes in him shall not perish but have eternal life. For God did not send his Son into the world to condemn the world, but to save the world through him. Whoever believes in him is not condemned, but whoever does not believe stands condemned already because he has not believed in the name of God's one and only Son. The other two crosses remind us of two criminals also crucified with Jesus. Each made their choice. ONE CRIMINAL - Accepted Jesus and is with Jesus forever. THE OTHER CRIMINAL - Rejected Jesus and is separated forever and will be in the place reserved for Satan and his angels. The whole world is represented by these two criminals, either you have accepted Jesus or you are rejecting Jesus. WHICH ONE ARE YOU!